The core curriculum at Year 9 includes World of Ideas, Mathematics, Science, Physical Education and Health. These studies are supported 4 days a week by a tutorial program that focuses on the students’ pastoral and welfare needs while also allowing time for organisational administration. Students also have the opportunity to choose 4 6 electives across the year, primarily in the Arts and Technology areas. We recommend that students focus on choosing subjects that interest them and that they will enjoy. Although it is not compulsory for girls to undertake a LOTE subject in Year 9, many students choose to continue their LOTE study from Year 8. These are the only electives that are pre-requisites for Year 10 subjects at the College and would count as 2 of the 6 electives. The ‘camp’ at Year 9 is an 8 day “City Experience” that takes place in central Melbourne. 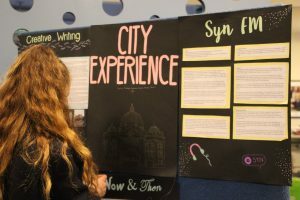 The City Experience gives students the opportunity to undertake action-based research linked to aspects of the City of Melbourne. This research forms part of the core curriculum in World of Ideas, Science and Mathematics and culminates in a presentation night to College staff and parents. Overall, we see Year 9 at Melbourne Girls’ College as an opportunity for students to learn and apply skills in core areas, explore new curriculum areas and make new connections with peers as students develop more extended working and friendship groups. View the 2019 Year 9 Handbook here.